Gain professional skills and knowledge from your local co-operatives and credit unions through the Co-ops in Schools (CIS) program. As a student, the pressure to gain professional experience can be overwhelming. The CIS mentorship program is a great way to be personally mentored by a co-operative or credit union professional and gain professional experiences, skills, and connections. Interested in the Mentorship Program? Join us for a tour of your local co-operatives! 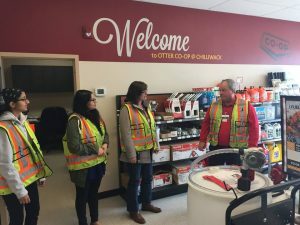 After attending the Co-ops 101 presentation, the Co-op Crawl lets you meet amazing professionals in your own community and ask further questions about the co-operative model. This presentation is the building block to the CIS program and your gateway to understanding how co-ops and credit unions support your community. 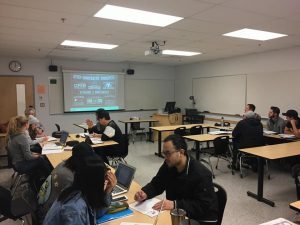 Students at University of the Fraser Valley participating in Co-ops 101. Students from Rick Hansen Secondary and UFV in Abbotsford on their Co-op Crawl. They toured Prospera Credit Union, Yarrow Eco-Village co-operative, and Otter Co-op (pictured).